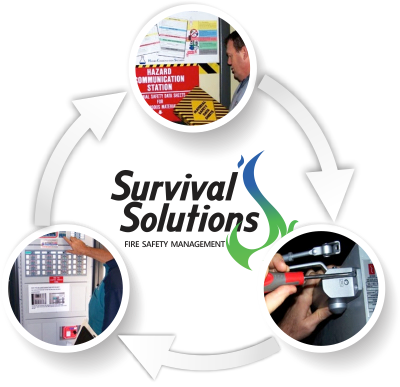 Survival Solutions can provide customers with a fire safety certificate or statement of compliance with all equipment installation. All fire systems in every building, including yours are designed to achieve one outcome GET HUMANS OUT ALIVE. Every fire safety system whether it be fire doors, detection systems, extinguishers or exit and emergency lighting is installed to facilitate the early detection of, and spread of fire to protect life. Fire protection products and services are designed to achieve this and include fire/smoke separation and containment, early detection and occupant warning, evacuation routes and illumination, fire containment and suppression. Every essential service measure is designed primarily to facilitate early and safe evacuation from fire or smoke for occupants of that building, space, machinery or equipment, with asset protection a secondary consideration. In order to achieve these outcome we need only understand, apply and follow the requirements of the Building Code of Australia and relevant Australian Standards for installation. In order to ensure these requirements are met we need only maintain the equipment in accordance with the relevant maintenance standards. This can only be achieved with a sound knowledge and understanding of the BCA and relevant standards, which Survival Solutions has. We offer a complete design, consult & construct sprinkler service. Need help with smoke detection systems or alarms? We have fire extinguishers to suit all needs & applications. Are you looking to buy only or have us design, supply and install equipment? NEED PRODUCTS SUPPLIED AND INSTALLED? With a wide ranges of products, many in stock, we can help you. We can visit your site & advise you on your requirements to meet the standards.